Once a highly cosmopolitan profession, law was largely domesticated by the demands of the Westphalian state. But as the walls between sovereign states are lowered, law is globalizing in a way that is likely to change law, lawyering and legal education as much over the next 30 years – when the students entering law schools today reach the peak of their profession – as it has over the last 300. 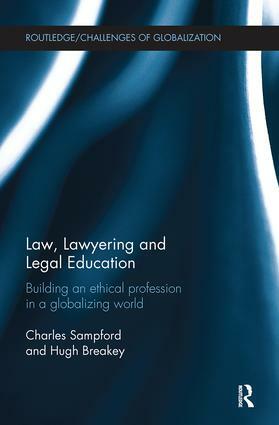 This book provides a sustained investigation of the theoretical and practical aspects of legal practice and education, synthesizing and developing nearly thirty years of Professor Sampford’s critical thought, analysis and academic leadership. The book features two major areas of investigation. First, it explains the significance of the ‘critical’, ‘theoretical’ and ‘ethical’ dimensions of legal education and legal practice in making more effective practitioners – placing ethics and values at the heart of the profession. Second, it explores the old/new challenges and opportunities for ethical lawyers. Challenges include those for lawyers working in large organisations dealing with issues from international tax minimisation to advising governments bent on war. Opportunities range from the capacity to give client’s ethical advice to playing a key role in the emergence of an international rule of law as they had to the ‘domestic’ rule of law. The book should stimulate great interest and occasional passion for legal practitioners, students, teachers and researchers of law, lawyering, legal practice and legal institutions. Its inter-disciplinary approaches should be of interest to those with interests in education theory, international relations, political science and government, professional ethics, sociology, public policy and governance studies. Part II Australian law schools after Pearce: a case study in educating critical, theoretical and ethical lawyers? What’s a lawyer doing in a nice place like this?